We have another Findables Find! A generous donor has donated this vintage lady head vase, circa 1956. 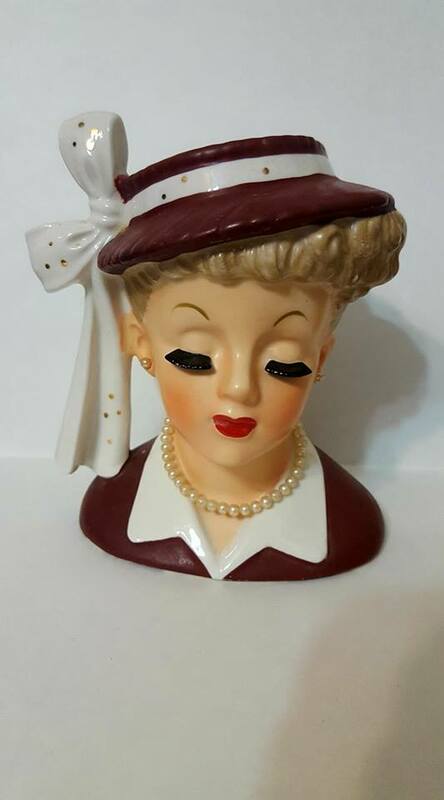 This is quirky find features a red hat, dress, fab eyelashes and faux pearls. She’s 5.25″ tall. How cute would this be as a Galentine’s Gift? Finally, something for all you head hunters out there. The kind of vase that helps you get ahead. She was certainly at the head of her class. We’re not sure where these were made, that’s a real head scratcher. We are asking $65 for this piece. All Findables proceeds benefit Midland Care to help us touch more lives. To purchase or for more information, call Findables at 785-273-2773 or come by the store and ask for Jean Doherty-Trupp.